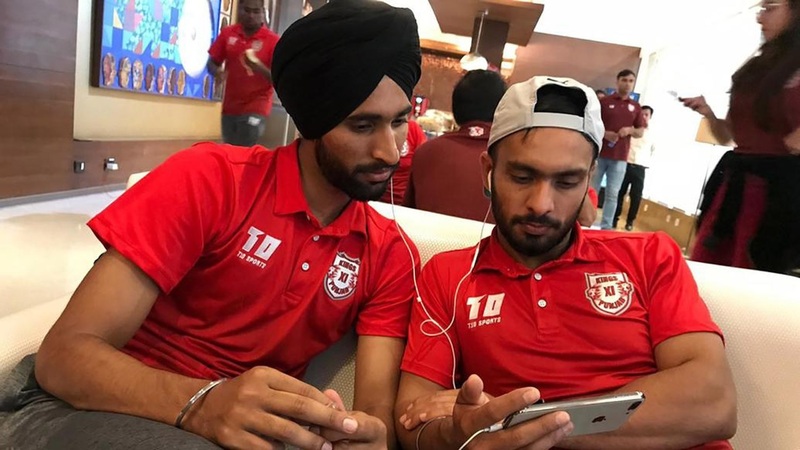 Calling out to all Kings XI Punjab fans to send us their most innovative, humorous and creative captions for above image. The person with the best caption wins 2 matchday tickets for our next home game against the Delhi Capitals on the April 1st, 2019. The contest closes on Monday, the 1st of April at 2pm. Don’t be late! This is the chance to win matchday tickets for Kings XI Punjab vs Delhi Capitals at Mohali. ** One winner would be rewarded with the two match tickets. ** Participants are eligible to win only if they have a valid Indian postal address. ** Contest winners that are rewarded with match tickets must note that Kings XI Punjab will not incur any costs for the said winners’ travel or accommodation. ** These prizes are non-transferable and cannot be exchanged for cash or other prizes. ** The decision of the Kings XI Punjab team on all matters relating to or in connection with this Contest (including the selection of the winner) will be final and binding on all parties concerned. It will be the discretion of the Kings XI Punjab team to decide the giveaways. ** The Kings XI Punjab team reserves the right to postpone, change, amend, extend, withdraw and/or cancel the Contest at any time or to accept or reject any entries at their absolute discretion without giving any prior notice and without assigning any reason whatsoever, any point of time and the participant shall not bring any claim against Kings XI Punjab in this regard. ** By participating in this contest, we assume that you have read and understood the Terms & Conditions of the Contest. The base of the logo is the crest. This is also the base for a shield or a coat of arms or a badge. It epitomizes pride: it is a matter of pride to be awarded a shield or to be wearing a badge on one’s chest. In fact, most of our National awards come in the form of badges that are worn on the chest. Most contests have a shield as an award. Thus this symbol is the mark of a brave winner. The peak of the crest showcases a banner inscribed with ‘K.J.H.P.H’. These letters stand for Kashmir, Jammu, Himachal, Punjab and Haryana, in the same sequence as they appear on the map of India. While our name may only have ‘Punjab’ as an intrinsic part, it is all these states that our team proudly represents. The word ‘Punjab’ in the name stands more for the fun and progressive mindset, which has come to be associated with people of the region. These lions bring to life the phrase ‘Sher-e-Punjab’, which literally means ‘Lions of Punjab’. Punjabis like to see themselves as brave, royal and with huge hearts, qualities best epitomized by a lion. These reflect in their loud, hospitable and gallant culture. Symbolically, the two lions represent Maharaj Ranjit Singh, the most intelligent and powerful ruler of North India and the erstwhile Maharaja of Patiala, Bhupinder Singh. The latter was the first Indian to lead an Indian cricket team to Lord’s in 1911 and was instrumental in setting up of the BCCI.